a gun punt but is too small for the purpose. 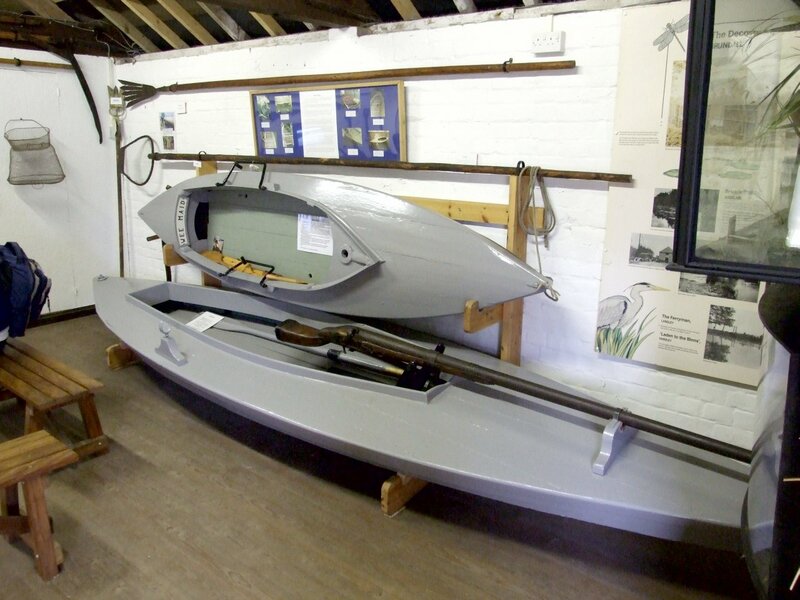 Intending to pick up on another recent theme from Chris Partridge’s Rowing for Pleasure weblog, I took some photos of gunning punts at another of my favourite small boating museums, the splendid Museum of the Broads at Stalham. So imagine my surprise when I found he has only today put up a series of photos virtually identical to mine. Ah well… Great minds and all that. I trust he won’t be offended if I put mine up also. Call me a pessimist, but I can’t help thinking this tactic of surrounding and shooting the birds must have led to some nasty incidents in which some of the boatmen must also have been injured. 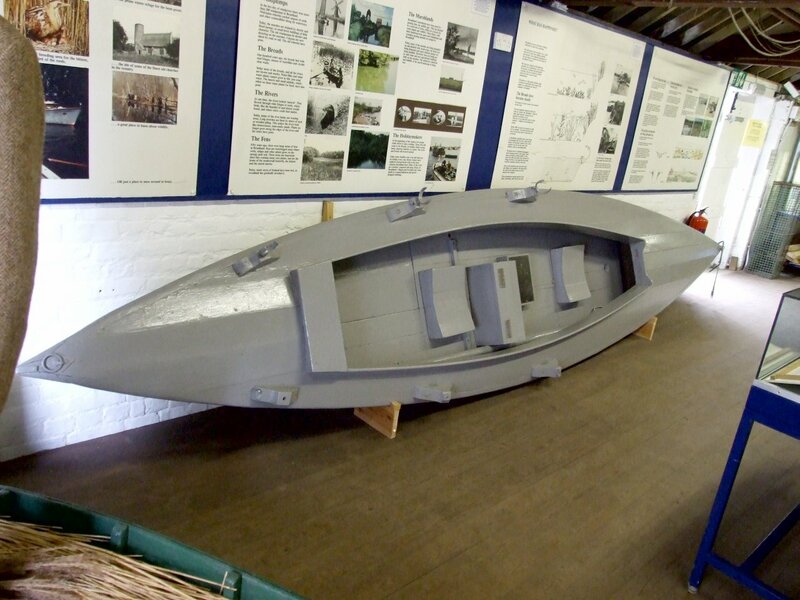 In a way, gunning punts are still used in Norfolk on a regular basis – for they were adopted for racing and developed into the scary Norfolk Punt, a high-powered sailing racing machine still sailed regularly on Barton Broad. But that’s another story that I’d like to tell one day. PS There’s an interesting postscript to Chris’s Rowing for Pleasure post on gunning here. The real point of interest for me in this book, is that it describes the owner of the original Scoter, upon which Maurice Griffiths based my boat – Idle Duck. He was Xavier Victor Alfred Octave de Morton, Count de la Chapelle, a much respected wildfowler, and co-founder of the Wildfowlers Association. Scoter still exists, being rebuilt near St Germans on the Tamar. I thought I would tell you that these punts were also in use on the Dee estuary here between the Wirral and North Wales. 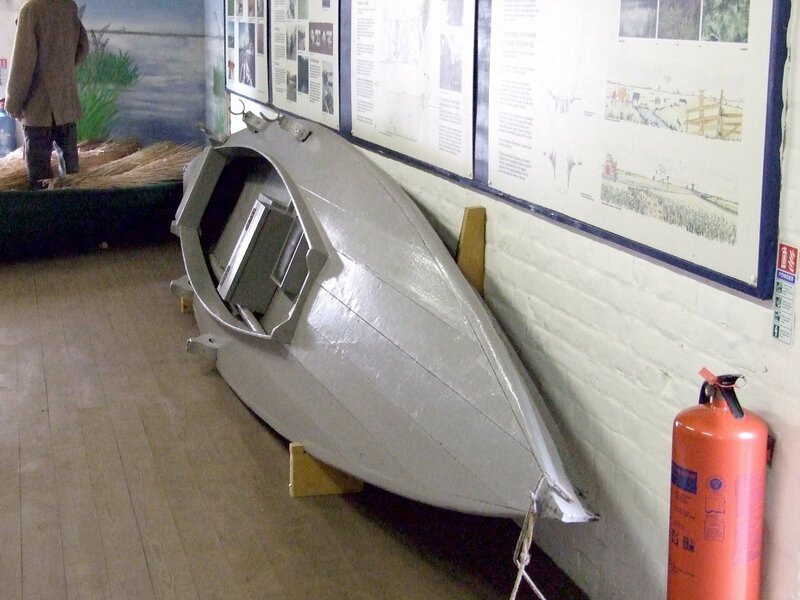 There is a punt in the Merseyside Maritime Museum collection. The paperback "Dee Wildfowler The last professional by harold Gill edited and published by Leslie Brockbank is a good source of information. The punts appear to have used the balanced lug for sailing; an unusual rig for a working boat. I hope this is of interest,. It certainly is Brian! These widespread boats are worth a study of their own – and very appealing little boats they are. The comparison I'd draw is with the North American Melonseed developed for similar purposes. How nice to hear from you. I haven't read the book I'm afraid – all that banging away at the birds would take the edge off it for me – but I'm certainly interested in Scoter. I didn't know there was a prototype for Idle Duck. Was she a similar size – and was the Count de la Chappelle a rather tall gentleman? On the ID itself, how's she going? Can we have pics some time please? You have to remember that this was a [short] harvest in those days, and the failure rate for shooting anything from a punt, which is virtually the only way of getting near ducks and geese on the water, is about 75%. All the birds were sent to market, and the marshmen, [some of whom were fisherman] lived on them as well. The Sport hunters like the Count, who only ever shot from a punt or standing in the water [he did not agree with shooting from the land] never shot over areas harvested by the professional wildfowlers, because it was their livelihood. Apart from the occasional extreme activities, usually led by so-called sportsmen, all the birds were recovered, usually by dogs. Hunters and bird shooters do not like to leave any wounded animals, and spend much effort tracking down a single wounded bird, with dogs of course, who return it to be dispatched. That's as much a part of country life and our culture as sailing and fishing; like oysters, originally not the preserve of the landed or wealthy, but enjoyed by local folk, not as a sport, but for survival. Interestingly, the current sport is dominated by ordinary folk; the local Marshwarden is a tree-surgeon and his predecessor was a brickie. I do not shoot myself, never having had the taste for it, but my concern is to maintain a balance between wildlife and our culture. I have sent pics of ID but will sent all I have on Scoter. I've no principled objection to people shooting birds to feed themselves or make a living – I grew up in one of the most rural and empty parts of England! Nevertheless, I doubt I could enjoy reading about wildfowling so please forgive me if I don't try! There's obviously a real distinction between subsistence shooting and the kind of thing some of the 'sportsmen' do. Scale has something to do with it – a near neighbour in Lincolnshire when I was a kid was Joe Nickerson, a wealthy landowner who enjoyed blasting at the birdies so much he would often kill a thousand brace of pheasant each year. That seemed to me to be something very different to the bloke who would catch or shoot a few rabbits from the next field to cook for his tea, though no doubt he enjoyed his chase also. Anyway… I think gun punts/gunning punts/duck punts are generally very cool little boats! As a long retired puntgunner whose forbears were professional wildfowlers and whose Gt Grandfather who was almost certainly involved in Colonel Russels shot of 704 Brent geese on the Dengie mud flats it is interesting to read the comments of those who obviously have no knowledge of the sport and those who have some knowledge of the sport but hardly any who actually know anything of real substance regarding the art of punt gunning. Perhaps a proper check on the facts is to be reccomended to those concerned. That is an interesting comment. Perhaps you could put us right; Most of what was stated was taken from books written by people who were wildfowlers, such as Wentworth Day. So I am uncertain what you were referring to specifically. The rest was comment about the craft, the theme of this site. I have only just picked up your comment of 2010 re Puntgunning. Jimmy Wentworth Day punted with my two uncles one of whom was the current pilot of the river. Chaps like Day used to turn up at these punting rivers and "employ" a local man to take him to where the wildfowl were so although I do not doubt his total enthusiasm for puntgunning and his ability to write about it lucidly and quite accurately he was largely reliant on the assistance of local people to take him to the birds. Somewhere in his book he mentions 'hiring a local chap' or words to that effect. However I do not intend to malign him at all for he wrote well on a good subject something which few of the professional wildfowlers could have done. 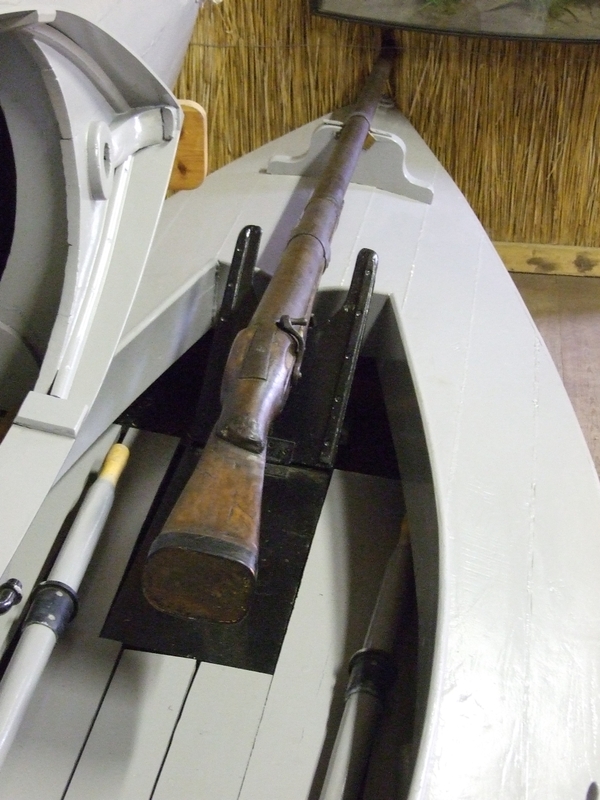 Re firing a punt gun from a high deck – I can offer no answer to your question other than to say in those days virtually all puntgunning on the Blackwater was done under moonlight which could have concealed them to a degree so I would not doubt that it happened. In notes I have provided to this website my father wrote that he remembers going out with his father on his boat 'Sunbeam' with the punt on deck and when they got to a suitable position the punt was taken and launched to assail the ducks from the punt rather than from the Sunbeam. Regarding your remark "how many punt gunners were hit" the answer is none. In those days there were tens of thousands of geese on the Dengie Flats and the punts could approach in a straight line head on to the birds so all shots were fired away from any of the other gunners. They would all have fired on a given signal from the leader – in the case of the shot of 704 it was Colonel Champion Russel who had gathered together thirty two local professional wildfowlers/fishermen to assist him. I have every reason to believe that my Gt Grandfather was involved in this shot and I have the gun he used. This shot is not as extravagant as it seems when you condider that 1000 ducks between 32 guns equals 31.25 birds per gun. There were many many single puntgunning shots which exceeded this number considerably but many were one offs. I should add that the punts used by the professional wildfowlers were rather crude open decked boats with some spring and little if any flair. They were constructed with Deal and Yellow Pine with 'oak bends for the knees. They were narrow and relatively unstable compared to the elaborate decked in versions that Jimmy Wentworth Day turned up with which were wider and more stable. Have you been able to contact Jan. I too would like to have that information about Scoter. I own Idle Duck, design around Scoter, and I am piecing together an anthology about these boats and their designers and owners. You can contact me via Gavin, and then direct. Would Geoff Stebbens please get in touch. I am hoping to experience, first hand, some punt-gunning in order to write about it for both a book on the East Coast and for the magazine Yachting Monthly. PS: Here’s my phone number!